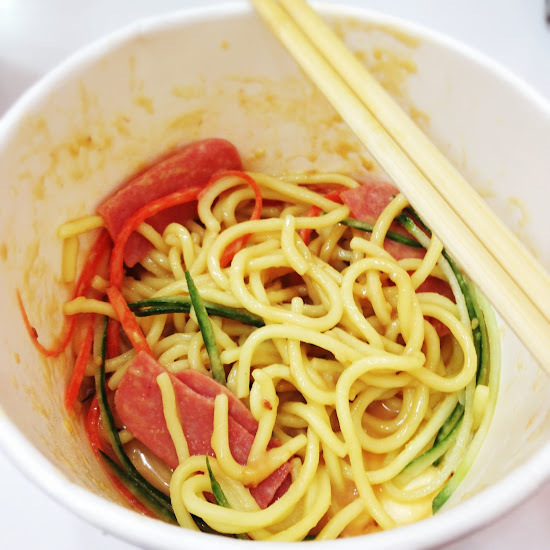 Skimmed through the store directory some time back when my friend wanted to eat at Bugis+ and it's one of my "want-to-try" places for Taiwan's light meal or light bite snacking. 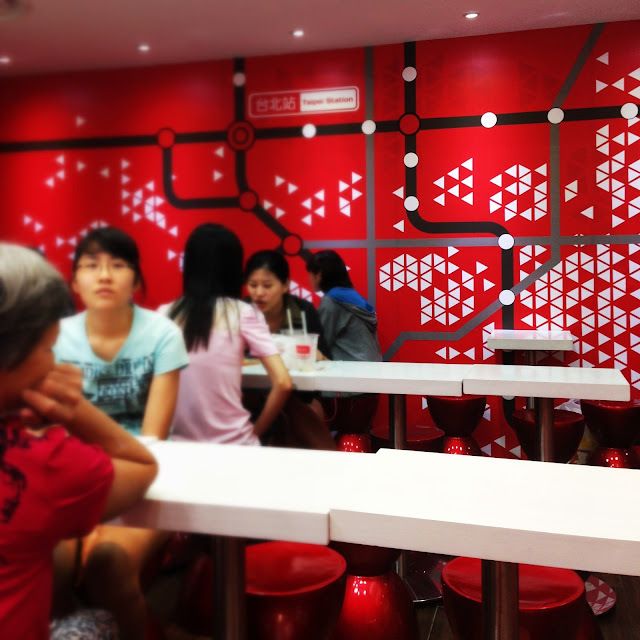 We were in Bugis yesterday and I remembered this place. We gotten a set to share as it seems more worth it. A set includes one main, one side and one drink, to choose between milk green tea with pearls or jasmine green tea with pearls. The small cafe is designed in white and red. White for the tables and triangle motifs on the bright red wall. The counter and the chair are red in color too. The place is quite small, similar to a normal Yakun cafe. Lots of tables and stools, sharing the long detachable tables with others. Squeezy. But the dining concept should be to eat and go, not for chill and chitchat. After ordering, we were given a reciept with a number. The counter will then buzz the number when the order is ready. 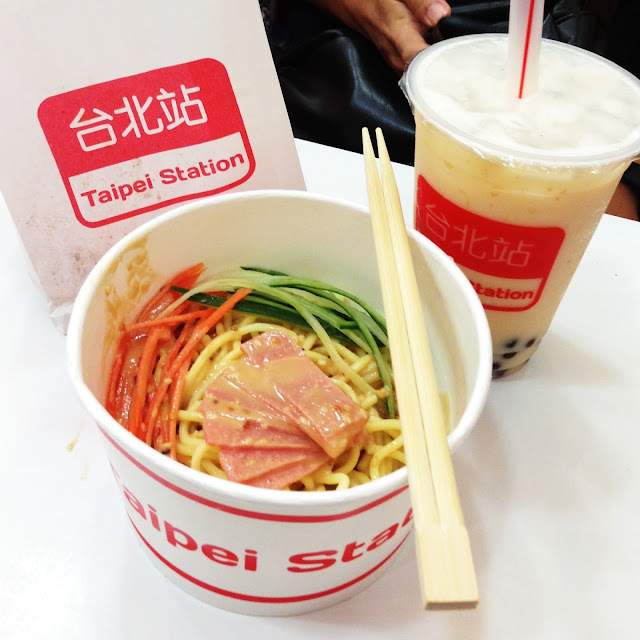 We had cold noodles with peanut sauce, sweet potato fries and a milk green tea with pearls. Everything is packed in disposable ware. I was quite skeptical with the outlook. Not quite sure whether it's worth snacking there. But one mouthful of the cold noodles in peanut sauce dispelled all negativity. Yum~ The peanut sauce is thick, not those diluted kind. It's only that there should be more cucumber and carrot. I can't bear to finish the noodles. It's so tasty. 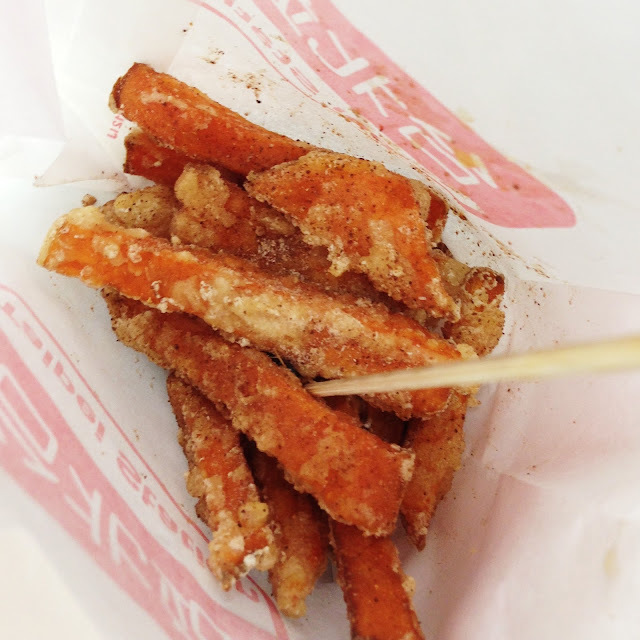 The sweet potato fries are tossed in plum powder form, giving a sweet sour taste. AL finds the taste too strong, but it's just nice for me. The milk green tea with pearls is normal. 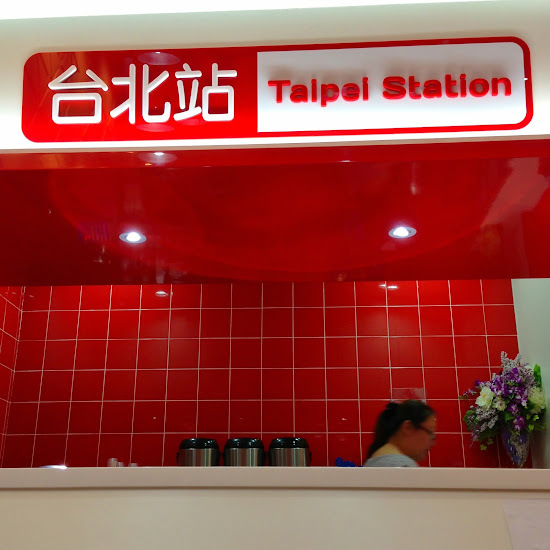 At least it doesn't taste diluted like the previous taiwan place we went. It's my first time drinking milk GREEN tea. Definitely a place for return trips. Next time we'll try their other food and see if the others are also worth going. Eating there made me feel as if we were in Taiwan, reminding me of our trips to Taiwan.